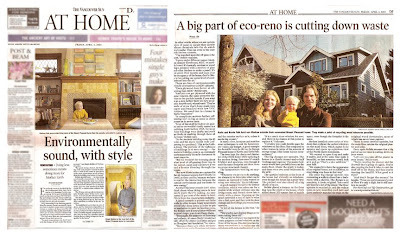 Friday, April 24th, Vancouver Sun–My brother and his wife were featured in the “At Home” section for the house they recently renovated in an environmentally friendly way. Everybody wants to do their bit for the environment these days, but it can be a bit daunting if you’re renovating. It’d be great to install solar panels on the roof, put in geo-thermal heating and dump your old energy-gobbling appliances for spiffy new eco-friendly models, but it’s darned expensive. This entry was posted on Friday, April 4th, 2008 at 12:39 pmand is filed under environment, family, renovations. You can follow any responses to this entry through the RSS 2.0 feed. You can leave a response, or trackback from your own site. How cool is that! I hope there are some newspapers left today for me to buy one! I know! We didn’t even know until Kevin called us up yesterday. Super cool.